Proposals is the core of Practice Ignition. Keeping track of your proposals allows you to manage your engagements with your clients and get a better overview of your practice. The Proposals tab allows you to create new proposals, see a list of all your proposals, and filter them by their current state. You can also export a list of all your proposals or rollover proposals by clicking the Rollovers and Export buttons on the left side of the +New Proposal button. For help with creating new proposals, click here. The tabs on the left side of the page allows you to monitor your engagements based on their status. You can click on the different tabs to filter your engagements. Each tab shows how many proposals are in each state. When a proposal is first created, either by the user, or through a web connector form, its status is set to Draft. While in the Drafts list, you can select multiple draft proposals and queue them for sending. To do this, click on the tick box(es) of the proposals that you want to be queued. This will show the Bulk Actions button. 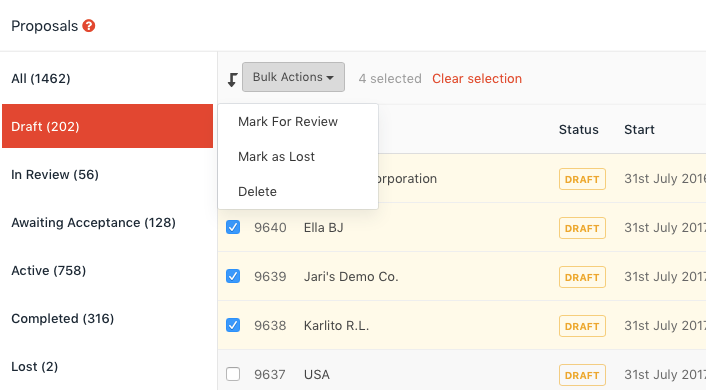 Click Bulk Actions, then Mark for Review. You can also select multiple proposals and click Delete under the Bulk Actions button to delete proposals in bulk. 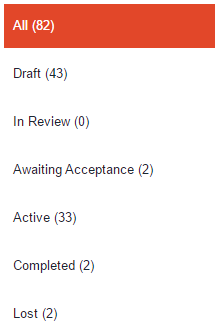 The In Review status is used mostly to know which proposals are currently being reviewed or ready to be sent. You can also use this tab to send proposals out in bulk. The In Review status can also be used as an "Approved" state. When a draft proposal has been reviewed and is ready to be sent out to the client, a user can 'approve' the proposal by sending the proposal to In Review. While editing a proposal, click the Actions button in the top right hand corner and click Mark for Review. Draft proposals can skip the In Review status when choosing Send to Client instead of Mark for Review. This will send the proposal to your client. If you have a number of proposals that have been reviewed and are ready to be sent, you can select some or all of them and use the Bulk Actions button and click Send selected which will email out all of the selected proposals to the clients. The Awaiting Acceptance tab contains any proposals which have been sent to clients and are awaiting acceptance. These are the ones you will be following up to make sure they are converted to 'Accepted'. From here the only 'Bulk Actions' you can take are to mass delete any proposals if you want. The Active tab holds all the proposals which have been accepted by your clients and are yet to be completed. The Completed tab hosts all proposals that are completed. When the end date of an accepted proposal has passed and all services are invoiced, the status of a proposal will be changed to 'Completed'. You can also manually mark a proposal as complete by clicking on Actions > Complete when viewing a proposal. Click here to learn more. If a client declines a proposal and the deal is lost, you can mark a proposal as 'Lost'. For more information on Proposals, see our article on 'Creating your first proposal'.